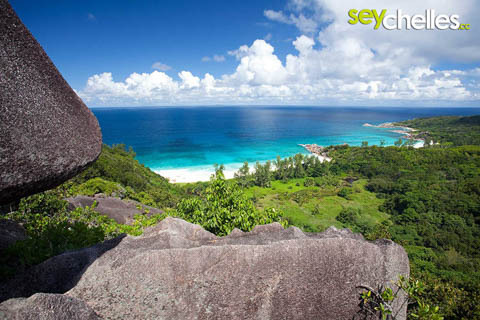 There are many places and beaches on La Digue you can easily explore on your own. But trust us, there are others, you´d rather take a local guide for. When we´ve visited La Digue for the very first time back in 2003 we thought it would be nice to walk all around the island. Been there, done that, but we´ll never do it again. We climbed over rocks and through the thicket, needed two hours for what looks like 200m on Google maps. And despite having 3l of drinking water per person, we ran out of water. Was it worth it? Rather not. The places we have seen haven´t been all that extraordinary. Plus: we didn´t learn a thing about plants, animals, etc. Your guide can give you all that interesting info and lead you to the places that are really amazing. Usually, local guides offer private tours as well as group tours. One guide we can definitely recommend is Robert Agnes.